Scott Miller, a Research Analyst at Thompson, Siegel & Walmsley, heightened his involvement with SCAN by joining the Board of Directors last year. While a Baltimore native, Scott’s connection to the Richmond community is deeply rooted. During his final year at Washington & Lee University, Scott decided to focus his job-search on the Richmond market, to join his now-wife Heather, in her plan to attend graduate school in Richmond, her hometown. Twenty-years later, he has found himself actively engaged with the community through his professional work and philanthropic efforts. 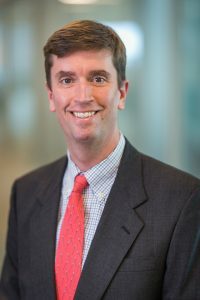 For the past 13 years, he has worked at Thompson, Siegel & Walmsley, an investment management firm for institutional clients, as well as individuals and families. Through the firm’s avid support of SCAN, Scott became involved with the organization after being introduced to its mission by Brett Hawkins, a colleague and former SCAN Board Member. He believes SCAN’s mission to be so valuable because of the organization’s effort towards advocating for children who are in difficult positions to do so themselves, in order to “shift their circumstances and future in a positive direction”. As a member of the Board, Scott serves on the Finance Committee. In addition to his role on the committee, he has developed a richer understanding of SCAN’s services by attending annual board sessions and fundraisers for the past few years. Through these events, he has had the opportunity to interact with SCAN staff and supporters across several of its programs, such as CASA (Court Appointed Special Advocates) and FAM (Families are Magic ). “SCAN is fortunate to have such a dedicated and passionate staff. That passion comes through in everyone I’ve met. I think the difficulty of a child’s circumstances and the opportunity to change that make the rewards all the more compelling.” said Scott. “The real effort towards Board education” from Executive Director Jeanine Harper, has distinguished SCAN as an organization that truly captures every opportunity to engage SCAN supporters, in hopes of promoting awareness of child abuse and neglect. Scott is looking forward to his first year serving on the Board of Directors and the events SCAN is hosting this Spring.